In honor of last night, I’ve composed my own version of the US national anthem. 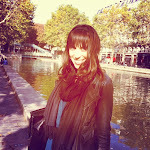 O'er the land of the French and the home of the Rebecca Leffler…. The Restaurant of the day award goes not to la Fontaine de Mars (I don’t think they’ll be needing my publicity anymore seeing as the President of the United States just had dinner there, that’s definitely a better ad than paying thousands for Superbowl spot, way to go Fontaine), but to Les Fables de la Fontaine. Owned by Christian Constant, the French chef who pretty much runs every restaurant on the rue Saint Dominique – from his famed, more fancy and pricey le Violon d’Ingres to the more casual Café Constant or even more casual Les Cocottes (my favorite steak and potatoes meal on the left bank – eat that, l’Entrecôte! ), Constant has a restaurant for everyone. Les Fables is a tiny place – I think the room can fit a maximum of 22 people – with a big heart. The staff are all warm and welcoming and one literally feels like one is dining in someone’s home (on a typical night that is, I can’t say the secret service and helicopters typically encircle my Parisian apartment on the average night). Les Fables specializes in seafood and offers a mostly fish-based menu, with a few options for pure carnivores as well. We started with an amuse-bouche of a parmesan cream with a red pepper coulis and croutons – divine. Since it was late (see: waiting outside for more than an hour just to walk down the street, merci Obama and co.), we skipped right to the main courses, though I must say the crispy Langoustines I had the last time I was there, still on the menu, are delicious. I had a grilled sea bass in a cream of pea sauce with grilled artichokes, a tuna sauce and parmesan cheese – incredible, especially wiped clean with the amazing mini-baguettes served to accompany the meal. Dessert was a vanilla cream custard crème-brûlée style on top of sugar biscuits with a pistachio sauce, followed by a fabulous hazelnut macaron. While I hesitate to share this spot (make sure you don’t take my seat if I want a reservation! 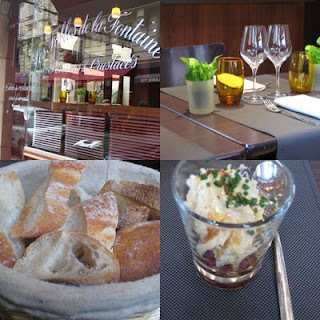 ), it is definitely one of the better and reasonably priced restaurants in Paris. Bon appétit ! After reading this post I now better understand Pres. 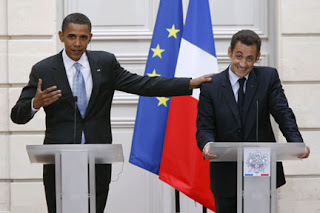 Obama’s statement: “American people love all things French, you've got the food, you've got Paris." I’ve just discovered this blog thru my FB friend Eugene Hernandez. Great job! Adding a link to La Fleur is an absolute must for me & Le Crew. Thanks! Brilliant, I felt like I was there and now I'd like to have dinner at Les Fables de la Fontaine!!! Seems so delicious and I won't take your seat!